The Securities & Exchange Board of India announced relaxed listing norms on June 23, 2015 aimed at encouraging the booming start-up industry to tap the local market, thus opening up investor access to the dramatic growth opportunities offered by such firms. Start-ups will be able to list on the alternative institutional trading platform. The regulator has done away with the promoter concept, eased lock-in requirements and diluted fund-usage disclosures under the liberalised norms. Sebi Chairman UK Sinha pointed out that there were more than 3,100 start-ups functional in India at the moment, making for a vibrant ecosystem. A large number of M&A deals were taking place in the space with investors pumping in billions of dollars, Sinha said. 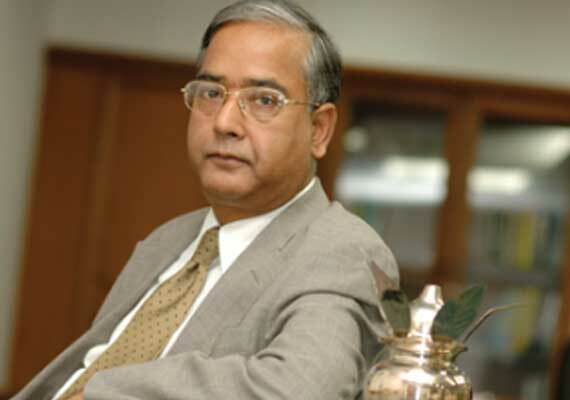 “The issue that we are trying to tackle is that most of the start-ups were thinking of listing aboard,” the Sebi chief said at a press conference. The Indian eCommerce market, largely fueled by foreign investors such as New York-based hedge fund Tiger Global and Japan’s Soft-Bank, is expected to cross $100 billion in the next five years, according to foreign brokerages. STEP IN RIGHT DIRECTION’Investment bankers said the alternative listing platform would enable startups to raise capital and list in the country. The institutional trading platform (ITP) was launched to allow small and medium enterprises to list without an initial share sale. “India has a growing number of start-ups and Internet-enabled companies and the alternative listing platform is a step in the right direction to enable these companies to raise capital and list in India. Sebi has relaxed a number of provisions related to disclosures and allocation that will ease the process and bring in high-quality investors on this platform,” said Gesu Kaushal, executive director, Kotak Investment Banking. “We should see the beginning of such high-growth companies listing in India.” The new measures will also apply to non-technology companies although there will be some differences. In the case of tech companies, 25% of the pre-issue capital has to be with qualified institutional buyers (QIBs). This will be 50% for non-tech companies. The regulator has also diluted disclosure requirements for such companies because of the nature of their business. Companies have been allowed to disclose just the broad objects of the issue and there is no cap on amount raised for general corporate purposes. Sebi rules stipulate no more than 25% of the funds raised can be used for general corporate purposes. Besides, it has also allowed discretionary allotment of up to 10% of the issue size to institutional investors. “Some of the changes like no cap on general corporate purpose in use of proceeds and also discretionary allocation to QIBs are steps to move the Indian IPO process as close as possible to the international process and would help companies consider (an) India listing over international listing,” said Sanjay Sharma, managing director and head of equity capital markets at Deutsche Equities India. Sebi said the minimum application size as well as trading lot for such issues would be Rs 10 lakh. This high limit would ensure retail investors are kept out, particularly since the risks are high.”We have given them (startups) a lot of freedom such as diluted disclosures, etc, but we are not allowing retail investors to come in,” Sinha said, adding, “These are companies with no profitability track record.” Among other proposals approved by the Sebi board, investors will soon be able to apply online for initial public offers (IPOs). The regulator will be drawing up norms for this. 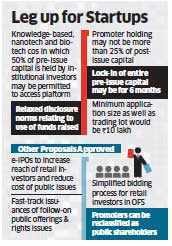 The e-IPO mechanism will halve the time taken for the process to six days. The current method of applying for a public issue makes it difficult to reduce the 12-day period from issue closure to listing and trading of shares. “The new e-IPO mechanism is a fantastic move by Sebi which would save a lot of time, cost and effort,” said Prithvi Haldea, chairman and managing director, Prime Database. Others too welcomed the move. “Reduction in IPO time is a very good example of positive exploitation of banking and trading technology for common good. Primary market investors will definitely welcome this move by Sebi,” said V Narasimhan, chief regulatory officer at NSE. ASBA SYSTEM MANDATORYSebi has also made the Application Supported by Blocked Amount (Asba) system mandatory for retail investors. Asba ensures the money needed to pay for shares will remain in the buyer’s account until these are allotted. More than 99.5% applications are currently received from centres where the Asba facility is available. Sebi said an analysis of a few public issues showed that Asba applications account for 99.90% of the total bid amount received from all investors. Under the proposed e-IPO mechanism, Sebi has also allowed more entities such as depository participants and registrar and transfer agents to accept Asba forms. The new system would be effective from January 1, 2016. Sebi board also approved re-classification of promoters as public shareholders under certain circumstances. This includes the new promoter replacing the previous one following an open offer or any other business recast such as an M&A. This will also be possible if it’s a professionally managed company with no identifiable promoter. Sinha said the outgoing promoter can’t have any control over the company either directly or indirectly. Besides, he can’t have special rights such as a board seat or veto rights. The regulator has simplified the bidding process for retail investors through the stock exchange route by making it mandatory for the seller to provide the option for bidders to place their bids at the cutoff price in addition to price bids. Sinha also said that Sebi was preparing to absorb the Forward Markets Commission and that the merger was likely to take place by the end of September.